They are not only from France but from the UK, Germany, even from Spain or Sweden, as it is difficult to only stick to France in this field. Some have already been running for several years while others are very recent. This 2018 overview of the InsurTech market is carried by astorya.vc and L’Argus de l’assurance, and does not claim to be exhaustive. But the insurance startup players should be able to easily identify themselves through these 9 trends. 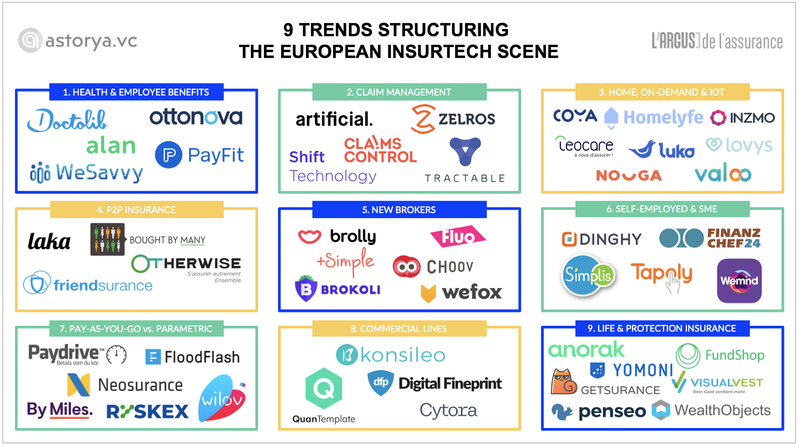 This InsurTech overview was compiled from astorya.vc’s proprietary scouting technology that spotted 1,788 insurance-related startups in Europe as of August 2018 (including 230 pure InsurTech). 515 of these startups received a capital injection (seed, series A, B or C), 75 of which in pure InsurTech which raised €800 million. This overview does not specifically cover blockchain startups or artificial intelligence, but focuses the analysis on those with a strong InsurTech component. Want more insights on the insurance technology market ? Subscribe to our Weekly Digest! Several models already exist, such as insurers similar to the Oscar model (United States), a few players on employee benefits (social benefits and collective social protection), as well as companies offering new services such as prevention, telemedicine or even appointment scheduling. The industry still seems to be poorly represented in France and Europe, compared to the United States, where it gathers 100% of the unicorns of the InsurTech (Oscar, CollectiveHealth, Gusto, Zenefits, Clover) or Asia, with WeDoctor, valued at over $1 billion. Alongside startups “partnering” insurers, in order to provide intelligent solutions in specific sectors (mainly in property and casualty) by combining tools, agile methods and AI, there are startups offering “white label” IT tools that are considered to be more like IT companies. The future will be in the hands of those who have a differentiating technology, and therefore have a better entry ticket, difficult to copy, and a higher valuation potential than an IT services company. *disclaimer: astorya.vc has invested in Zelros in Nov. 2018. Following the example of Trov or Lemonade — highly broadcasted and capitalized — many startups are now involved in comprehensive home insurance and/or simplified insurance for everyday objects (mobile phones, bicycles, drones, etc.). Some also combine insurance and connected objects by promising a “fairer” insurance. 4. Peer-to-peer insurance: end of a cycle vs. new offerings? The initial promise of a model such as Groupon — offering better prices by bringing together similar policyholders — is extremely difficult to meet. This probably explains the low number of similar projects, while the pioneer Bought By Many has been running since 2012! The promise has therefore evolved today towards the exploration of new insurance — not covered or poorly covered — by bringing together a sufficient number of policyholders to be able to create a specific product. But will the size of these markets be sufficient? This category includes traditional brokers who have updated their customer interface, white-label solution providers or websites offering to assess the customer’s insurance situation to cover existing “gaps”. The most recent evolution: Spanish players offering to consolidate and store existing contracts to better manage all customer insurance. As for archetype 3, the difference should be based on innovation and technology (AI), which will create new insurance needs for the client. The expectations appear to be lower for questionnaire-based models, which are proving to be simple lead generators for traditional insurers. Insurance for very small businesses and self-employed workers, the Holy Grail of insurers, presents real challenges, especially when it comes to distribution and customer fragmentation. This group includes startups focusing on new uses or populations (e.g. on-demand insurance for freelancers) as well as startups promising insurance adapted for the lower category or the self-employed workers. The winners of this growing market will be the ones going beyond the traditional marketing speech and creating strong communities around specific businesses. This affinity approach should be supported by truly specific products. Pay-as-you-drive only continues to attract English startups, covering mainly specific populations. But this category also includes the emergence of companies using similar technologies (IoT, smartphones) for parametric insurance, whether they concern floods or travel insurance. Pay-as-you-drive has long existed among traditional insurers and it’s difficult for a new player to offer competitive rates. In addition to weather insurance, first case of use for some insurers, technologies such as blockchain and smart contracts enabled startups to offer parametric insurance products on other still limited vertical markets (aircraft delay, life insurance, abandoned insurance, for example). Some InsurTech aim to innovate in the field of high risks, either as insurers/brokers or as providers of technological solutions for claims assessment and evaluation. Only the English market seems to be concerned at the moment, probably because of a more complex positioning for a startup (expertise, BtoB segment). Beyond the new brokers, there are only a few startups in life insurance, contingency fund and savings. There is also a very P&C orientation in the innovation projects of traditional companies. Is it due to the regulations? To the conservatism of savers in relation to new supports? To the consumers who are not aware of the need for coverage? Innovation in banking is accelerating and many startups are emerging in the United States and Asia, with simpler and cheaper products and mixed savings and protection offers for non-covered customers. More and more players are positioning themselves around wearables where data analysis allows for better life underwriting and clears the areas of prevention and the promotion of healthier lifestyles. The insurance industry is not immune to the surge of startups. But for specific reasons in this industry, the development of InsurTech is slower and less “disruptive” than in other sectors. This first overview of InsurTech — conducted by L’Argus de l’assurance in collaboration with astorya.vc — explains the situation. Fundraising, partnerships, events, studies of consulting firms, creation of incubators or investment funds… there hasn’t been a week without startups hitting the headlines in the insurance industry. And some are already predicting that these newcomers should sweep away the old world. “It’s difficult to strike a balance in the assessment of this InsurTech phenomenon. We always overestimate the short term and underestimate the medium term,” explains David Dorn, senior advisor at astorya.vc. This fund, composed entirely of institutional investors and insurance executives, was launched a few weeks ago in order to invest in new startups linked to the insurance industry. “This market is still very recent. In France, 60% of FinTech startups created five years ago have a turnover of less than €1 million.” says Florian Graillot (astorya.vc). astorya.vc’s proprietary scouting technology lists 230 “pure” InsurTech in Europe, and has only selected about twenty French startups among the 50 “important” ones in Europe (see list above). Oliver Wyman lists about 131 of them only for France in its 2018 Insurech Radar. There are different methodologies used, but the analyses agree on the difficulty of accessing the insurance field. In France, only one startup obtained its insurance approval: Alan, which offers online health insurance to SMEs and self-employed workers. “InsurTech often start with a great idea, but their excitement soon has to face the reality of regulation and distribution,” says Thierry Léger, CEO Life Capital of Swiss Re. “The main strength of insurers lies in the risk carrying. Balance sheet is a major differentiating factor compared to other industries.” says Florian Graillot (astorya.vc). All startups have different life expectancies. This is what Oliver Wyman points out in its 2018 Insurech Radar, which is highly hesitant about the sustainability of insurance in use — “While the idea of short-term insurance for specific situations seems promising in theory, it often requires too high customer acquisition costs” — or collaborative insurance such as Otherwise, Wemind or Yakman: “Despite the large number of InsurTech positioned on this model, the market opportunity and chances of success are limited.” “Providing a great customer experience is necessary, but no longer sufficient. The challenge here is industrialization and scalability, i.e. how to quickly reach several million of customers in order to amortize fixed costs,” confirms Fabrice Asvazadourian, Director of Accenture Strategy France and Benelux. With this in mind, it’s difficult to be satisfied with a purely local approach. “InsurTech without a European outlook are facing a major issue. Although the broker specialized in online health coverage for very small businesses has an interesting value offering, it’s very difficult to replicate it in another country,” adds Jean-François Gasc, Managing director Accenture Strategy for insurance in Europe and Latin America. By crossing the threshold and exploiting the size effect, the objective is obviously more challenging in a BtoC context. Especially because, in the absence of any real differentiation, startups face the power of incumbent insurers, “The idea that InsurTech will disrupt the insurance market is unlikely”, analyses Jean-François Gasc (Accenture). “Over the last three years, the movement from BtoC to BtoB has become a reality. InsurTech consider that working with insurers is more relevant than competing with them, by positioning themselves only in a part of the value chain,” notices Florian Graillot (astorya.vc). And Shift Technology, which uses artificial intelligence (AI) to better fight fraud, is a very popular example. Also, the relationship between insurers and startups seems to be quite complicated. Several corporates, such as AXA, Allianz, MAIF or Malakoff Mederic, created their own investment fund or even their own incubator, they are very fond of these innovation accelerators. Reinsurers are also active in this field. And, according to Thierry Léger of Swiss Re, one of the most interesting areas of development is the BtoBtoC. The reinsurer created the company IptiQ: “This platform aims, among other things, to develop partnerships with recognized brands. The challenge is to find the product, the ecosystem where insurance fits naturally,”. “Tomorrow, the real breakthrough will be to sell insurance through channels other than today’s: the platforms,” says Florian Graillot (astorya.vc). This is only the beginning of the history. Even on the financing side: “Investment in InsurTech in Europe remains modest, with €800m, which is the annual IT budget of a large international insurer. And 15 InsurTech monopolize 80% of the financing,” says David Dorn. But he adds that optimism applies: “This is a first wave in Europe, with some great promises. Certainly, no InsurTech has disrupted the market. But everything can evolve very quickly: five years ago, no one believed in Oscar. Today, the American company is worth $3 billion!”. astorya.vc invests in tech startups to build the next insurance generation. Leveraging its own sourcing technology astorya.vc identifies promising startups, structures their growth through its extended network of mentors, and develops new business opportunities with its insurance investors. Raised from insurance players, astorya.vc is the first early-stage investor in Europe, focused only on the insurance industry. VC fund investing in early-stage / insurance startups all over Europe.